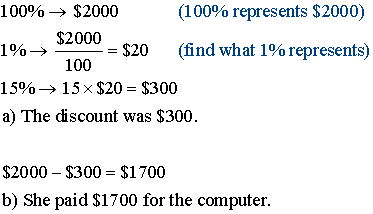 The following are some examples of 5th Grade Math Word Problems that deals with percentages. 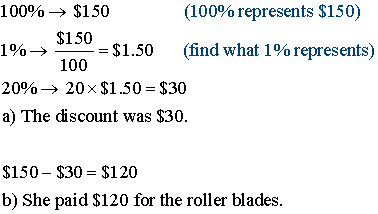 These word problems are solved with the help of block diagrams or bar models. The usual price of a computer was $2000. At a sale, Maggie bought the computer at a discount of 15%. a) How much was the discount given to Maggie? b) How much did she pay for the computer? The usual price of a pair of roller blades was $150. At sale, Joanne bought the pair of rollerblades at a discount of 20%. a) How much was the discount? b) How much did she pay for the pair of roller blades? (1) Marilyn saves 30% of the money she earns each month. She earns $350 each month. How much does she save? (2) At the Natural History Museum, 40% of the visitors are children. There are 36 children at the museum. How many visitors altogether are at the museum? (3) Bill bought cards to celebrate Pi day. He sends 60% of his cards to friends. He sent 42 cards to friends. How many cards did he buy altogether? (4) Bruce cooks 80% of the pancakes at the pancake breakfast last weekend. They made 1120 pancakes. How many pancakes did Bruce cook? 1. Eris had 3 times as many cookies as Sean. After Eric ate 50 cookies, he had half as many cookies as SEan. How many cookies did Eric have left? 2. Brenda had 3 times as many dresses as Cathy. After Brenda gave away 75 dresses, she had half as many dresses as Cathy. How many dresses did Brenda have left? 3. In the 5th grade, 3/7 of the students are boys. If there are 36 girl in 5th grade, how many students are there altogether? 4. In the 6th grade, 5/8 of the students are girls. If there are 200 girls, how many students are there altogether? 5. After spending 1/4 of his money, Frankie had $13.50 left. How much money did he have at first? 6. Elizabeth spent 1/3 of her money on a purse. This left her with $120.00. How much money did Elizabeth have to begin with?